SAN JOSE, Calif., July 19, 2017 -- Popular in Europe and Asia, the first modular compact electric utility vehicle (CUV) from Cenntro Automotive Corporation is now available to the US market, through distributor Tropos Technologies and their dealernetwork. Called the METRO, the all-electric vehicle is a highly flexible, and modular CUV ideally suited for local delivery, maintenance crew transportation, parking enforcement, and people transport on campuses or in communities. The METRO is available in three basic configurations, a pickup bed, cargo box, and tradesman package, all of which can be modified to suit the operator's unique needs, before or after purchase. "The METRO is ideal for campuses, municipalities and local business who are striving for the most contemporary transport options and a low carbon footprint," said John Bautista, CEO of Tropos Technologies. "Hundreds of METRO vehicles are delivering goods, services, and passengers all over Europe and Asia, and we're excited to be the leading distributor in the U.S. for such an innovative solution to the low-speed vehicle segment." The METRO is a dependable, versatile vehicle that is ready to work at an affordable price point, designed with safety in mind. The crash tested and street-legal 10 kW low speed vehicle can achieve optional ranges of up to 120 miles, top speed of up to 50 mph (per local laws), an estimated MPGe of 145, up to 4.3 M/Kwh, on-road payload capacity of up to 1,200 pounds (1,500 pounds off-road), and a turning radius of 150 inches (12.5 feet). Customers can choose from several different configurations which include the open truck bed with fold down sides, hydraulic dump bed, utility bed with ladder/lumber rack, and van box with rear and side doors. Accelerating the METRO is the Cenntro integrated powertrain, Cenntro Power for improved performance, weight balance and handling. Cenntro's proprietary design achieves high efficiency with low production costs, at a price that is best in its class. It is also simply designed to have no maintenance, minimal moving parts and a long life. 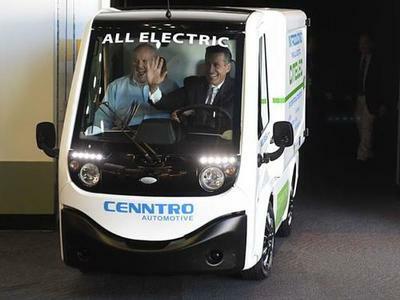 "With the METRO, we are pushing fleets to reimagine the value their compact utility vehicles bring to their overall facility operations," said Peter Wang, CEO of Cenntro Automotive. "Counterparts to the METRO simply do not provide the market the complete package customers are looking for, and at Cenntro, we're dedicated to doing better than the status quo. From our 100% US final assembly to our integrated powertrain, Cenntro electric vehicles deliver high-value, dependable and low cost of ownership vehicles to meet market demand."